Rare pelagic creature called a blue button. The blue button lives on the surface of the sea and consists of two main parts: the float and the hydroid colony. The hard float is round, almost flat, and about one inch wide. 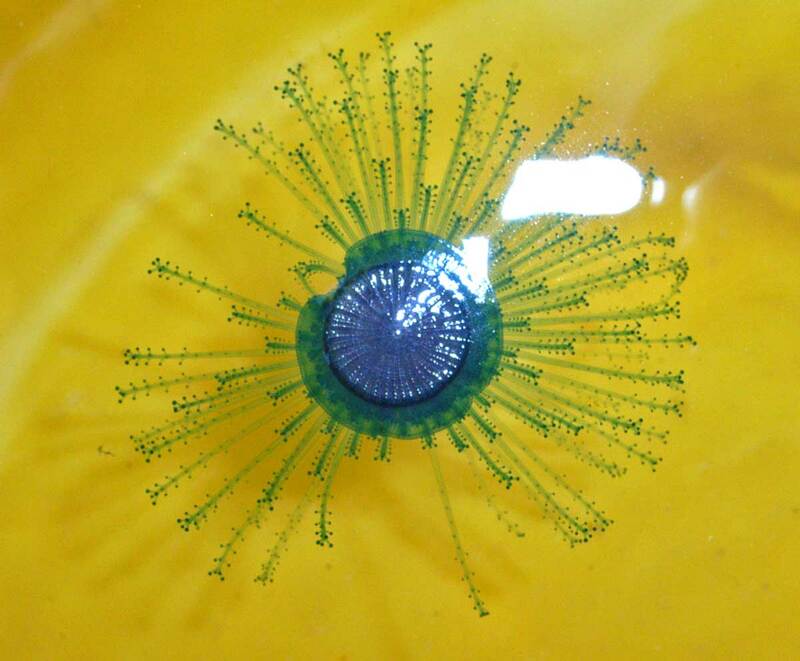 The hydroid colony, which can range from bright blue turquoise to yellow, resembles tentacles like those of the jellyfish.Each strand has numerous branchlets, each of which ends in knobs of stinging cells called nematocysts. The blue button sting is not powerful as the portuguese man-o-war, but may cause us skin irritation. The blue button itself is a passive drifter, and is part of then neustonic (right on the ocean’s surface) food web. It is preyed on by the sea slug Glaucus atlanticus (sea swallow or blue glaucus) and violet sea-snails of the genus Janthina. It competes with other drifters for food and mainly feeds on copepods and crustacean larvae. The blue button belons to the Phylum Cnidaria, and therefore has a single opening, which is used for both prey intake and waste expulsion.